It’s estimated that more than half of U.S. adults have gingivitis (gum disease). 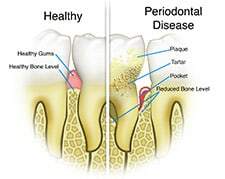 Gingivitis, in some cases without treatment, can lead to periodontitis (gum disease with loss of supporting bone around the teeth) and host of other health problems. The dentist may also suggest specific toothpastes, mouth rinses, and Perio Protect therapy treatments. We may also prescribe antibiotics to fight infections. Surgery is required for the most severe cases. While it is normal to evaluate your gum health at your check-up and cleaning appointment, patients with active periodontal disease will need to be monitored more frequently than the normal twice per year check-up. If you have been experiencing any symptoms like bad breath, bleeding or tender gums, please let us know. We will decide what is the best form of dental treatment to restore your gums to optimum health.